“Machu Picchu village”, the village below the Inca city of Machu Picchu, is known worldwide as “Aguas Calientes” because less than a kilometer from the village, you can find “thermal baths”; They are actually thermo-medicinal waters, surrounded by a beautiful landscape of mountains. 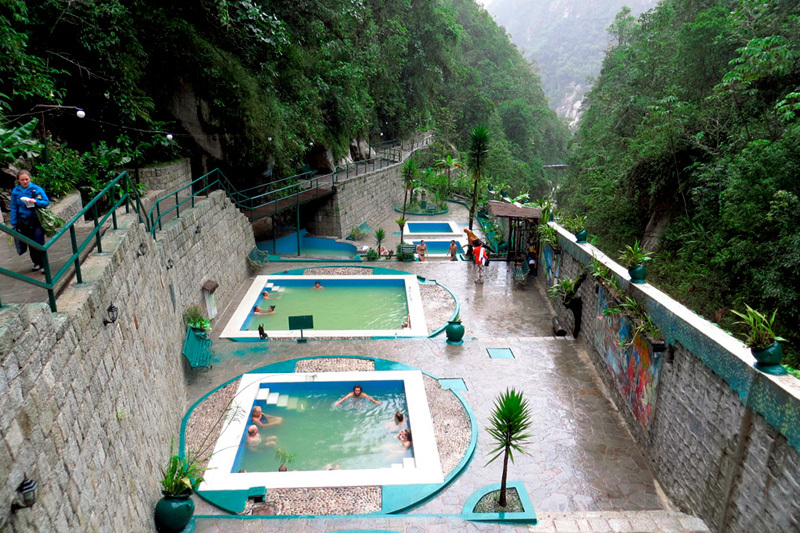 Where are the hot springs of Aguas Calientes? The town of Aguas Calientes is very small and the only vehicles you will find are the ecological buses that will take you to Machu Picchu, so you will have to reach the “hot springs” walking. To get there, just follow the river that goes down in the middle of the city, this will take you to the path that leads to the baths ; Are less than a kilometer (15 minutes walk) from the town square, in the middle of mountains. Where do the Hot Springs of Machu Picchu come from? These hot springs come from a natural source of volcanic origin and may have the purpose they have now, since the time of the Incas. It emerges from underground channels and springs up on rocks at high temperatures; These are taken to the small swimming pools (you will not be able to swim in them); The water in the pools is opaque yellow, giving the impression of being dirty, but it is the color that gives the sulfur. The temperatures of the hot springs of Machu Picchu range between 38º C and 46º C. If you want crystalline hot springs you can try the hot springs of Cocalmayo. The hot springs of Machu Picchu are a perfect end to your visit to Machu Picchu, especially if you toured the Huayna Picchu mountain or some of the fabulous short hikes of Machu Picchu. When to visit the thermal baths of Machu Picchu? Most people visit the hot springs after their tour of the Inca city of Machu Picchu; However many people stay for days only by the hot springs. The rainy season in Machu Picchu has some enjoyment; The thermal baths of Machu Picchu are open air and this becomes an incredible experience, being inside the pools of hot water, while a torrential rain falls, sometimes accompanied by a radiant sun, on you, try it. The thermal baths of hot waters are composed of five small swimming pools, the infrastructure is basic and useful; It has dressing rooms, showers (cold water), hygienic services and a café-bar where you can order Pisco Souer, a delicious cocktail based on “pisco” (Peruvian national drink). The thermal baths of Machu Picchu are open from Monday to Sunday from 5 am to 8 pm; Sundays are the busiest days. 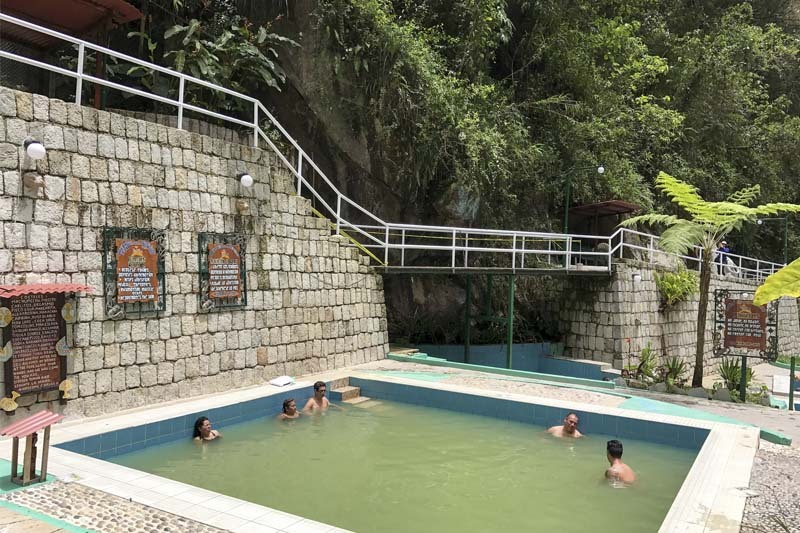 The thermal baths are very nice, but there are many other things to do in Aguas Calientes. You will need to carry bath implements with you: bathing suit, towel, sandals and personal cleaning items (shampoo, soap, conditioner); If you forget this or simply do not want to bring it, you can buy or rent them before entering the bathrooms. These are the prices of the Entrance to the Hot Springs of Machu Picchu.